Click picture to play video – opens in new window. Edi beo þu heuene quene performed with voices, citole and gittern by The Night Watch, sung by Andy Casserley in Middle English and Ian Pittaway in modern English. The Night Watch stay true to the original harmonisation, with the manuscript notes heard in the interplay between voice and gittern, and they also improvise additional harmonies between the gittern and citole. I have no religious conviction, and would describe myself as indefatigably atheist. The vast majority of surviving medieval music, though, is religious, so at some point a decision possibly has to be made about repertoire: to include or avoid the devotional. The appropriate fit of singer and song is always a complex and mysterious affair. Personally, I don’t feel I always have to share the experiences within a song lyric or necessarily agree with its point of view. To do so would be to severely limit what I can perform, since there are plenty of early music and traditional songs involving murder, loss at sea, miraculous events and so on, none of which I am personally familiar with, and none of which I have any wish to experience. The same must be true for the majority of singers of this repertoire. Do you need to be sea-worthy to sing a shanty? This being so, there can sometimes be something odd about singing religious songs for a non-religious audience that is different to any other song type, in my experience. My most powerful and peculiar confirmation of this was when performing the beautiful and traditional Down In Yon Forest in a folk club. The song has been collected in several variant versions, from the early 18th to the early 19th century, and it is a variant of the carol called Corpus Christi, first attested in the handwritten commonplace book of Richard Hill of London, dated to the first third of the 16th century. By the time of the Down In Yon Forest variant, collected from Mr. Hall of Castleton by Ralph Vaughan Williams in 1908, its arresting imagery included the bells of paradise; a hall covered in purple coffin cloth; a bed covered with red (cloth, presumably); the Virgin Mary kneeling on a stone; a flood of water and blood underneath a bed; and a thorn bush that blossomed white on the day the knight was born. All of this the folk club audience took in their stride as I sang it. 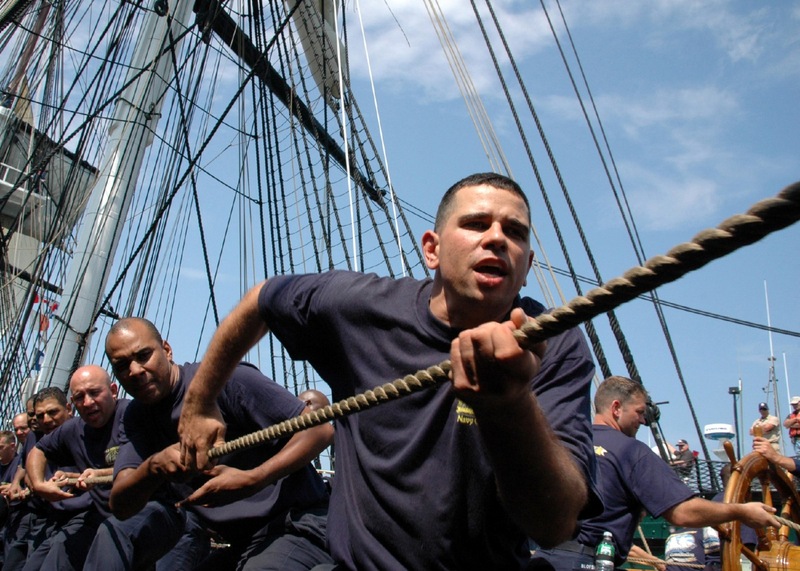 The whole room of people had joined in loudly and lustily on choruses about halyards they had never pulled on ships they had never seen, bellowed about battles they had never fought in, and sung tenderly for the love of women they had never met. Yet their joining in with the Down In Yon Forest refrain, “And I love my Lord Jesus above any thing”, was a collective whimper of embarrassment. Somehow, the sung declaration of love for Jesus felt like a qualitatively different leap compared to being the imaginary crew on board ship, or fighting fantasy wars, or loving make-believe women. I still wonder about that experience. I personally have no compunction in being an atheist singing a devotional song. To sing it or join in, I no more have to believe in God or the Virgin Mary than I have to be sea-worthy to sing a shanty or carry a knife to sing a murder ballad. But it is only with religion, it seems, that the problem may arise for a singing audience. The Annunciation of Mary in a window of 1340 in Ely Cathedral, Cambridgeshire. Edi beo þu heuene quene (hereafter rendered in modern characters as Edi beo thu) is found in its entirety in a single source, a manuscript found in Llanthony Secunda Priory in Gloucestershire, now classified as Corpus Christi College Oxford 59, dated between 1265 and the late 13th century. It includes only 3 pieces of music, all religious songs, the rest of the manuscript largely devoted to Anticlaudianus, a work of moral theology by 12th century French theologian and poet, Alain de Lille, and a gloss of De consolatione philosophiae by 6th century Roman senator and philosopher, Boethius. There are 8 verses written for Edi, divided stylistically into the first 5 and last 3. In the first 5 verses, the anonymous writer uses the metrical form and numerous phrases from Latin hymns, translated into Middle English. The first-person narrator of the song declares his love for Mary, praising her in standard religious ways: she is blessed, a comfort, unblemished, pure, etc. The song also shows the unmistakeable influence of the troudadours, whose influence on worship of Mary was mainstream Catholicism by the 13th century. In Edi, Mary is praised in just the same way troubadours praised the courtly object of their affection: for her complexion, for her fair beauty, for her noble virtue, and the love bond with her is affirmed as for a courtly lady and a knight. (For more on the profound influence of troubadour lyrics on worship of Mary, click the blue text to go to “Why do you not praise her?”: the Virgin Mary and the troubadours.) The final 3 verses are more overtly doctrinal, the personal gives way to the impersonal, and troubadour poetic conventions disappear. It is therefore highly likely that these final 3 verses are a later addition. Mother unblemished, maiden pure, such in this world none other is. It is clear for all to see, of all women, you have the prize. My sweetest lady, hear my prayer, have pity on me if your will it is. You ascend as the ray of dawn which rises out of the darkest night. From you springs new illumination, bathing the whole creation in light. Sweet lady, on me have compassion and have mercy on me, your knight. Blossom sprung from a single root, the Holy Ghost made you heavenly queen. That was for the good of all people, for our eternal souls to redeem. Both hand and foot and all completely, serving you in all ways that I can. You are earth’s goodly seed, on you falls the heavenly dew. From you springs the blessed fruit the Holy Ghost has sown in you. You bring us out of care and dread that Eve so bitterly for us brewed. You shall us into heaven lead, so well sweet is that heavenly dew. Mother, full of noble virtue, maiden so patient, lady so wise. I am in your love now bonded, and for you is all my desire. Help me till my life is ended, reconcile me to your son, his will. The last 3 verses that follow are impersonal and doctrinal, lacking the striking imagery and poetry of the previous verses, expressing such theological ideas as: You have a great lineage from David the powerful king … Marvellously, the Lord arranged that you were a maid without husband … Bring us to your abode and shield us from hell’s wrath. The medieval church specified 8 modes in which its music was to be composed, each employing a natural scale, i.e. no sharps or flats. The dorian mode, for example, ran from D to D, the phrgian mode from E to E, the mixolydian mode from G to G, and so on, all without accidentals. (The one exception was that of turning B to Bb when played or sung against an F to avoid this clashing tritone sound.) Edi, running from F to F with a fixed Bb, fits none of these ecclesiastical modes. Remarkably, it was not until 1547, two and a half centuries later, that Swiss music theorist, Heinrich Glarean (or Glareanus), gave theoretical validation to the mode in which Edi was written when he extended the 8 modes to 12. In his Dodecachordon, published in Basle, one of the 4 modes he added was ionian, running from C to C. A quick glance at the music below will show that Edi is in the ionian mode, transposed up a fourth, with a starting note and finalis of F. This mode suggests that, though the subject is religious, the context of Edi beo thu was not ecclesiastical, not intended to be sung in church. Whether the scribe of the manuscript was a monk at Llanthony Secunda Priory is a matter of debate, but there is no reason why a monk would not know a song that was to be sung outside of a monastic act of worship. Medieval music worked very differently to modern music’s use of largely major and minor chords to create harmonies as a bed on which to place the melody. In the 13th century, at the time of Edi, a musical phrase started and ended with a perfectly consonant or stable interval, being a unison, an octave or a fifth. Within a phrase, intervals could be dissonant or unstable, seconds, fourths and sevenths, working their way back step-wise to perfect consonance again by the last note of a finishing cadence. Outside England and Scotland, thirds and sixths were considered an imperfect consonace, more stable than dissonance, but not stable enough for resolution: in England and Scotland only, thirds were stable and perfectly consonant. The polyphony of Edi is not typical of medieval music, for one technical reason: this is a gymel, from the Latin, cantus gemellus, twin song, two part polyphony in which the usual fixtures of medieval music are largely laid aside in favour of accompanying almost entirely in thirds and sixths, often moving in parallel. This definition of gymel as marked by thirds and sixths is from the 15th century music theorist Guilielmus Monachus (about whom nothing is known, not even his nationality – English or Italian? ), though the practice is evident in England from the beginning of the 13th century. Another example of a gymel is Nobilis humilis in the Codex Upsalensis, c. 1280, a hymn to Saint Magnus written out by the monks of Saint Magnus Cathedral, Kirkwall, Orkney. The melodic movement will sound unfamiliar to modern ears, since it is in the lydian mode, beginning and ending on F. The polyphony, however, is very modern-sounding, avoiding the crunchy dissonance so typical of movement in medieval harmony, relying instead on the continual sweetness of parallel thirds. Nobilis humilis, a gymel contemporaneous with Edi beo thu, harmonised almost entirely in parallel thirds. Left, in the Codex Upsalensis, c. 1280; right, in modern notation. To hear Nobilis humilis being performed, click here. Other than in the gymel, we don’t hear such use of thirds and sixths in harmony until the musical revolution of John Dunstaple in the 15th century, which ushered in the renaissance sound, the ‘English countenance’, a term coined in admiration by the French poet, Martin le Franc, in his Le Champion des Dames, 1440-42. The third, the sixth, and full triadic chords of root, third and fifth were the harmonic intervals so often used by John Dunstaple which, together with his throwing 4 voices wide apart in pitch for the first time, ushered in the early modern period in music, the beginning of the now familiar SATB (soprano, alto, tenor, bass). This is the reason the thirds of gymel harmony in Edi sound so sweet and modern. Edi takes us to a time when England had its own site of Marian pilgrimage, established by Rychold or Richeldis de Faverches, a devout English noblewoman, in Walsingham. Her encounter with heavenly visions is told in The Foundation of the Chapel of Walsingham, a ballad of c. 1485 published by Richard Pynson, and therefore known as The Pynson Ballad. A statue of Richeldis de Faverches at Walsingham. The verses tell the story that, in 1061, Richeldis de Faverches, widow and Lady of the Manor, had 3 visions or dreams in which the Virgin Mary showed her the house in Nazareth where the annunciation took place. The exact dimensions of the house were dictated to Richeldis in her dreams, and she was instructed to build it in the village of Walsingham. Richeldis immediately set her builders and carpenters to work on the special task but, after the first day of work, they returned looking pessimistic. That night, unable to sleep, she heard singing coming from the barely started structure. She ran outside to look and was amazed to see angels departing and that the building had moved 200 feet or more. In the morning the builders agreed that the house had been completed properly, beyond their capabilities, and that it stood solid on its new foundations. Richeldis’ son, Geoffrey, became Lord of the Manor and Earl of the Marches. On Richeldis’ death, Geoffrey took responsibility for Mary’s holy house and it thrived as a centre of pilgrimage. Geoffrey left to go to the holy land to fight in a crusade, but pilgrims unable to make devotional journeys abroad could now go to their own holy land in Norfolk: Walsingham became known as ‘Little Nazareth’. In the middle of the 12th century, Augustinian Canons established The Augustinian Priory to the Annunciation of the Blessed Virgin Mary next to the Virgin Mary’s house; and, by the 13th century, Walsingham’s importance as a pilgrimage site was comparable in England to Rome, Jerusalem and Santiago de Compostela, travel to which was impossible for nearly all English Christians. With rapidly increasing numbers of pilgrims, the village grew to cater for them. By 1252, a charter had been granted to hold a weekly market and an annual fair. Such was its growth and importance that pilgrims travelled from all over Britain and Europe, including the monarchs of England. Before Edi was written down, Henry III had visited Walsingham in 1241; at about the time it was written, Edward I visited in 1280 and 1296. By the 14th century, pilgrims were visiting in such numbers that the priory was extended and the small wooden holy house had a stone chapel built around it to encase and protect it. After Edi was penned, the royal pilgrims were Edward II in 1315; Henry VI in 1455; Henry VII in 1487; and Henry VIII in 1513, before his conflict with the Catholic Church. Such are Edi beo thu‘s lyrical, musical and historical contexts. Let us now return to the question with which we started: the performance of devotional medieval music in a secular context. For any song to be performed well, a singer has to connect with it in some way, either with its broad theme or with some content in the lyric which resonates personally. In this sense, a singer is like an actor: a song, like the script of a drama, needs to be inhabited to give it meaning. Perhaps that is where my folk club audience came unstuck joining in with Down In Yon Forest. In these modern times many find religious expression problematic, debating the logical veracity of miracles and religious faith; wondering about the medieval morality of ‘needing’ a figure like Jesus or Mary to ‘save’ us from a God who would torment us in everlasting hell; posing questions about a heavenly role model for women who is impossibly both a mother and a virgin, and whose chief virtue in the Bible is meekness and obedience. 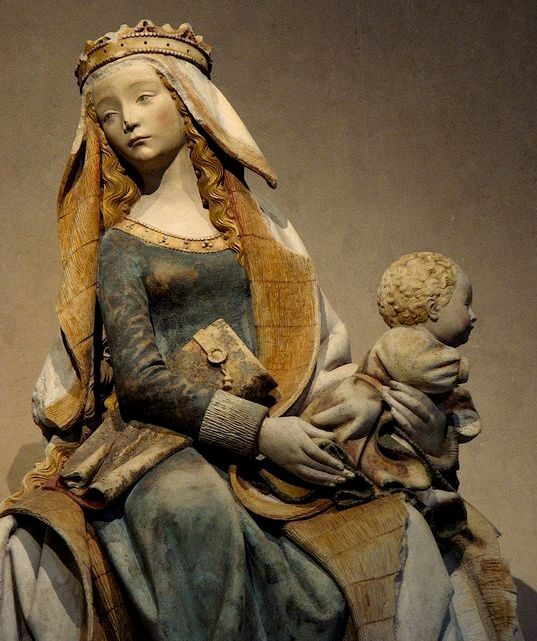 The Virgin of Toulouse, Notre Dame de Grasse (Our Lady of Grace), 1451-1500, now in the Musée des Augustins, Toulouse, France. All such critical analysis is important, of course, but if that is all we do I fear we are missing something. The musical mode of Edi, not being among those used by the church, may indicate that this devotional song is non-ecclesiastical, an illustration that in the middle ages people could not ‘turn off’ their religious sentiment, as for them it was a culture, a worldview, a universe of meaning. The complete division between the secular and the sacred is a modern idea, only possible in a context where atheism is thinkable and religion is a matter of personal belief rather than the culturally enforced public policy of church, state and society. If we are to understand history, to get inside the heads and under the skin of the people of the past, we have first to understand their collective conceptual framework and its impact or influence upon an individual. For singers of early music who wish to climb inside a song and understand it from the inside, this will often include an understanding of loving “Lord Jesus above any thing” and the motivation for composing a love song for the “queen of heaven” who is “full of noble virtue”. This may be problematic. As a modern atheist, I can appreciate the charm of this song’s melody and the beauty of its lyrics, but I am necessarily unable to fully appreciate the sentiments of religious devotion which inspired the anonymous writer to compose it; and, as a modern person living in a largely secular society, I cannot make the imaginative leap to mentally recapture a Europe in which being Catholic is normative and there are many thriving centres of Marian pilgrimage. Perhaps this is similar to the line my folk club audience couldn’t cross, wordlessly saying, ‘In song, I can work on an imaginary ship, fight an imaginary battle, love an imaginary woman, but I just can’t imagine loving Jesus’.